Democrats are hoping to flip that advantage on Election Day. In their eyes, the stars have aligned. They have a high-profile liberal darling running a competitive race for U.S. Senate at the top of the ticket. They have a controversial Republican president expected to generate backlash in his first midterm elections. And enough judicial seats are up for election that Democrats could flip the four sprawling appellate court districts that serve Austin, Dallas and Houston. Hillary Clinton won those districts in 2016, but the courts are currently held entirely by Republicans. “Democrats are gaining ground every day,” said Keir Murray, a Democratic strategist working on judicial races in Houston. Appellate judges, who serve as the intermediaries between the state’s scores of trial courts and its two high courts, are rarely top of mind for voters. Instead, judicial candidates rely on straight-ticket ballots, and lean heavily on the popularity of their parties’ leaders. This year, Democrats are taking heart in that Beto O’Rourke, an El Paso congressman locked in a tight race against incumbent U.S. Sen. Ted Cruz, has progressives across the state energized. Strategists predict that even if he can’t topple Cruz, O’Rourke could bring out enough support in battleground areas like Dallas to flip some state House and Senate districts. Democrats hope courts will be on that list, too. But O’Rourke’s coattails will have to be long. 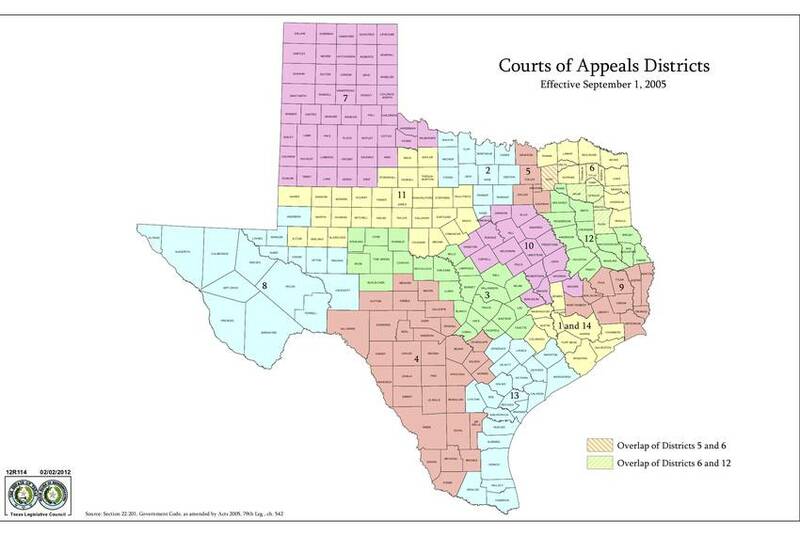 Texas Courts of Appeals Districts. This year, Democrats are hoping to narrow their losing margins in the deepest-red counties and pick up votes in city centers. But Republicans are skeptical that that strategy will push them over the top. “We’re definitely going to win. There’s no question in my mind,” said Bunni Pounds, a Republican strategist and former Congressional candidate working on several Republican judicial campaigns in North Texas. But she also acknowledged that turnout so far indicates that Republican victories may not be as handy as they have been in the past. “The turnout is in models with the presidential year, which means our percentages will be lower,” she said. Voters rarely differentiate much between down-ballot judicial candidates. A woman may outperform a man, or a Hispanic-sounding name may make a point or two of difference, but for the most part, the candidates will “sink or swim” together, Murray said. That means if Democrats win at all, they’re more likely to win big. Courts that serve urban areas could flip entirely, not just inch toward the middle. That would yield much-needed ideological diversity, Democratic candidates said. Harris County has the longest ballot in the country, with 75 judges up for election, said Harris County GOP chairman Paul Simpson. Republicans there have mobilized to prevent ballot fatigue and keep Democrats from flipping the two appellate courts in the area. “We’re working doubly hard, all the way down the ballot. Best I can tell, they’re hoping Robert Francis O’Rourke carries the whole ballot for them,” Simpson said, using Beto O’Rourke’s full name. That may not be a bad strategy. Harris County, the state’s most populous, long held out as Republican, but in recent years has begun to tinge bluer. In the Houston area, Aiyer said, it’s “only a matter of time” before the appellate courts flip, too. 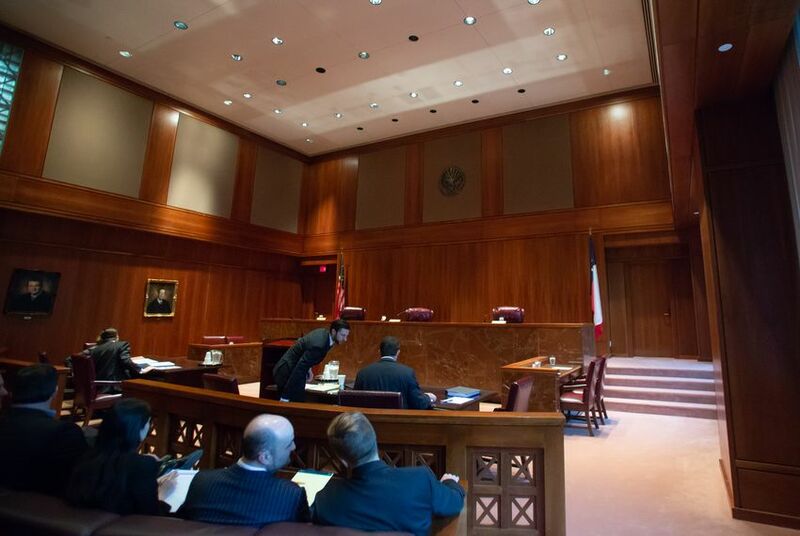 The story is much the same hundreds of miles west in central Texas, where Democrats have fielded candidates in all four races for the Austin-based 3rd Court of Appeals. Mike Toth, a Republican appointed to the court by Gov. Greg Abbott in September, is fighting to hold onto his seat in an appellate court race that’s proved perhaps the ugliest in the state. Toth has embraced Trump-style campaign issues (one mailer prominently features the president’s face) and accepted thousands in campaign donations from the hardline conservative group Empower Texans, which recently had an ethics-related case revived by the appellate court. Democratic challenger Gisela Triana, a district judge in Travis County, is hoping Toth is controversial enough to propel her to victory. All told, more than $1 million has been raised for the down-ballot contest. Asked whether Democrats can pull off a sweep, Chari Kelly, a well-connected Austin prosecutor running as a Democrat for a different seat on that court, didn’t hesitate. “Oh yes,” she said. History is her guide: Two years ago, when Clinton won the Central Texas judicial district, two Republicans ran unopposed and won seats on the court. “The blue wave came. There was no one there,” she said. This year, she said, Democrats are poised for that wave — be it a tsunami or a ripple. “If not now, when?” Kelly asked.